As is often the case, much of the information you’re told about surviving a nuclear attack is complete bunk. That’s largely because mainstream media journalists are, of course, totally clueless when it comes to anything related to actual science. Almost none of them know a single useful thing about radioactive isotopes, radioactive decay, half-life, etc. Yet those of us in the independent media are extremely well informed on this and other topics. In my case, I’m the inventor and author of a United States patent called Cesium Eliminator, proven to eliminate radioactive cesium-137 from the digestive tract through a combination of dietary ingredients. I’ve also stockpiled 10,000 kg of material to manufacture this lifesaving supplement in an emergency, and I plan to donate it to victims of the first nuclear event that takes place on U.S. soil. What I’m going to offer you here is a science-based guide on all the basic things you need to know about surviving a nuclear strike. Not all nuclear strikes are survivable, by the way, due to the laws of physics and biology. And a lot of what you’ve been told about North Korea’s missiles is completely false. They are far more capable of striking the USA than almost anyone dare admit. Rush Limbaugh, for example, stupidly thinks Kim’s missiles keep landing in the ocean by accident. He seems to have no idea that this is all part of the altitude testing protocol with the goal of achieving altitude, not geographic distance. Once you achieve sufficient altitude, you can redirect those missiles to almost any city on the planet. The basics: What actually kills people in nuclear attacks? Very large numbers of person were crushed in their homes and in the buildings in which they were working. Their skeletons could be seen in the debris and ashes for almost 1,500 meters from the center of the blast, particularly in the downwind directions. Large numbers of the population walked for considerable distances after the detonation before they collapsed and died. Large numbers developed vomiting and bloody and watery diarrhea (vomitus and bloody feces were found on the floor in many of the aid stations), associated with extreme weakness. They died in the first and second weeks after the bombs were dropped. During this same period deaths from internal injuries and from burns were common. Either the heat from the fires or infrared radiation from the detonations caused many burns, particularly on bare skin or under dark clothing. After a lull without peak mortality from any special causes, deaths began to occur from purpura, which was often associated with epilation, anemia, and a yellowish coloration of the skin. The so-called bone marrow syndrome, manifested by a low white blood cell count and almost complete absence of the platelets necessary to prevent bleeding, was probably at its maximum between the fourth and sixth weeks after the bombs were dropped. Atomic bombs — those are the kind that North Korea has right now — produce tremendous heat as a byproduct of the fission process. Thus, they produce not only radiation and radioactive isotopes (see below) that kill biology and contaminate the environment, they also produce high heat that sets fire to buildings and “roasts” anyone near the detonation. In the case of Japan, many buildings of that era were made out of bamboo and wood, creating a kind of tinder box of fuel ready to be ignited by the thermal effects of the atomic bombs. 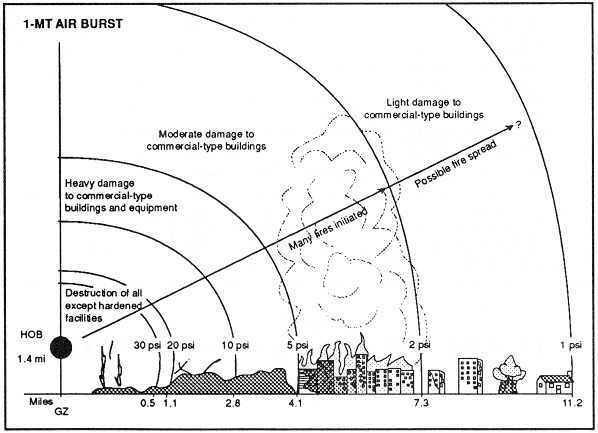 The following chart is extremely useful, as it explains the likely effects of a 1-Megaton nuclear detonation (air burst) on structures, depending on their distance from ground zero. In essence, almost everything in a 4-mile radius is turned to rubble and is likely not survivable unless you are already in an underground bunker at the moment of detonation. Buildings from 4 – 7 miles will likely catch on fire and many will burn and crumble. Buildings beyond 7 miles away will suffer some damage but may not burn. As you can see from this chart, if you happen to occupy a building anywhere close to the detonation, you are probably dead, and all the preparedness in the world won’t help you much. However, if you’re farther away from the detonation, you might survive the immediate physical threat, but then you have to deal with the nuclear FALLOUT issue, which can kill you much farther away (see below for fallout survival strategies). It has been estimated that a weapon with a fission yield of 1 million tons TNT equivalent power (1 megaton) exploded at ground level in a 15 miles-per-hour wind would produce fallout in an ellipse extending hundreds of miles downwind from the burst point. 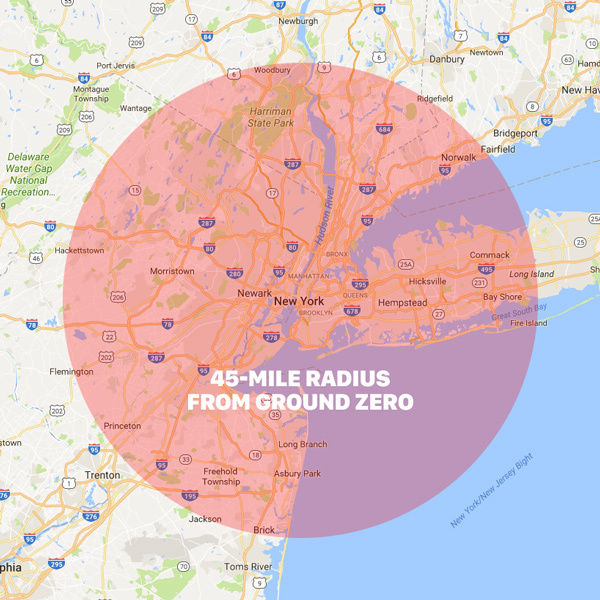 At a distance of 20-25 miles downwind, a lethal radiation dose (600 rads) would be accumulated by a person who did not find shelter within 25 minutes after the time the fallout began. At a distance of 40-45 miles, a person would have at most 3 hours after the fallout began to find shelter. Considerably smaller radiation doses will make people seriously ill. Thus, the survival prospects of persons immediately downwind of the burst point would be slim unless they could be sheltered or evacuated. In other words, even if you’re 25 miles away, you can be killed by radiation in just 25 minutes of open air exposure. Even 45 miles away, you only have 3 hours before you’re exposed to a lethal dose of radiation. As you can see, if a nuclear weapon were to detonate over downtown New York City, almost everybody on Manhattan Island and surrounding areas (including New Jersey) receives a lethal dose of radiation within hours. Even those on Long Island and much of upstate New York are in danger of receiving fatal doses. Obviously, it’s all but impossible to even evacuate the New York / New Jersey region of the country in anything less that weeks of time. Here’s a list of Health Ranger Store products that can help protect you from iodine-131 radiation or detect your current level of exposure. We also specialize in clean food for preparedness, which is why we offer storable organic food pails that are lab verified. Tip #1) Don’t live in a city that’s likely to be targeted in a nuclear strike. Because if you do, you’re basically f#cked. Tip #2) If a detonation occurs, get out of the wind path that carries the radiation. It helps to know the prevailing winds beforehand. Tip #3) You can survive a close-in nuclear strike if you have an underground bunker and an air filter that can remove radioactive particles. This requires considerable preparation with food, water, emergency communications, firearms defense, a backup power source and all the rest. No small feat. But it is possible, and you won’t be able to resurface for a period of at least 1-2 weeks without exposing yourself to a fatal dose of radiation, depending on the intensity of the exposure in your area. For most people, it’s easier to bug out than to build a bunker. Read Bugout.news for tips. If the initial blast, heat wave and collapsing buildings don’t kill you first, you’ll face the challenge of surviving the radiation exposure. This is where most people don’t track the science and end up making really bad decisions by inadvertently exposing themselves to fatal doses of radiation. It’s important to note that you can’t “feel” moderate-level radiation exposure as it’s happening, even as you’re getting a fatal dose that will kill you in hours or days. 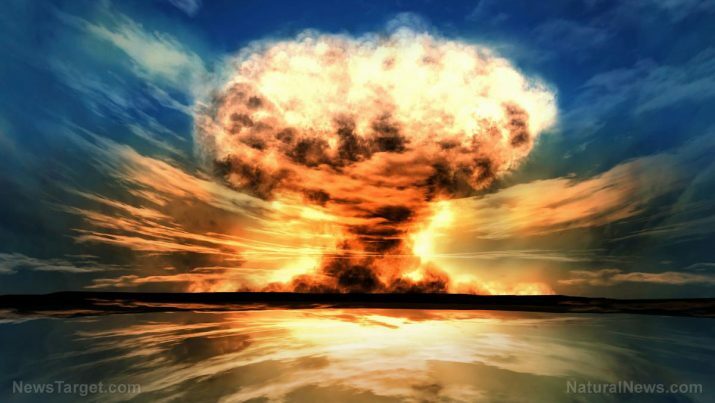 The key to understanding how to survive all this is really simple: Atomic bombs are fission bombs, which means atomic nuclei are split through a process of fission, creating heat and radioactive byproducts as a result. Typically, fission byproducts of atomic bombs are created in the mass range of 80 – 140. Iodine follows pathways of fluorine and iodine. Cesium follows pathways of POTASSIUM. Strontium follows pathways of CALCIUM. In other words, everywhere your body puts calcium, it will put strontium if you are exposed to it. This is how you can end up with strontium-90 in your bones. Because cesium mimics potassium, it ends up in all the cells of food and dairy products, which is why you can’t drink cow’s milk after a fallout event (it’s full of cesium-137). Iodine-131 half-life is 8 days. Cesium-137 half-life is 30 years. Strontium-90 half-life is 28 years. So iodine-131 is “gone” in 8 days x 10, or 80 days. Cesium-137 is “gone” in 300 years. Strontium-90 is “gone” in 280 years. This explains why no one wants to eat the food grown near Chernobyl to this day. It’s contaminated with cesium-137, which contaminates the soils and water for 300 years, ending up in all the plants and animals. Both Iodine-131 and Cesium-137 have 100% absorption through the GI tract, meaning if you eat them or drink them, you will absorb them with 100% efficiency, and your body will deposit those radioactive elements throughout your blood, tissues and organs. From that point forward, you will be irradiating yourself from the inside out, and that can easily kill you with even a very small mass of ingested radioactive isotopes. AVOIDING IODINE-131: Take iodine supplements to “front load” your thyroid with iodine, avoiding thyroid damage from iodine-131. Evacuate affected areas. Do not drink milk from animals in the affected area. Use a water filter that can remove iodine and fluoride. Drink only treated water, and make sure your water filter works on gravity alone (because the electricity will be out). The best filter for this is the Big Berkey water filter with add-on filters. I have extensively tested all the top brands of water filters, and you can see the results at WaterFilterLabs.com. All sources of iodine work to help protect your thyroid from iodine-131, by the way. If you want to support our work, we offer a quality-controlled, lab-tested iodine supplement called Nascent Iodine. Note, however, that taking iodine does NOT protect your biology from all the other radioactive isotopes such as Cesium-137. AVOIDING CESIUM-137: Cesium is extremely dangerous both for short-term exposure and long-term contamination of the soils and environment. Avoiding cesium-137 means avoiding all food, milk, water and other consumables produced in the area for at least 150 years. AVOIDING STRONGIUM-90: Strontium follows calcium into the food supply, making its way into animals and plants. Avoiding strontium means avoiding all consumables produced in the fallout area for at least a century, perhaps longer. Click here for the Health Ranger Store’s nuclear threat preparedness items, including RadStickers that let you know how much radiation you’ve been exposed to. Once you make it through the initial blast and have escaped the radiation, you still need to survive the social chaos, lawlessness, starvation and disease that will likely follow. My best advice on all this is to read Natural News by downloading the Natural News app right now (available for Android and iPhone devices) so you can get our news every day without censorship. We offer ongoing editorial coverage of survival and preparedness strategies, including natural medicines and remedies, surviving superbugs and pandemics, and personal security tactics. The bottom line is that you need to read Natural News regularly to stay informed about natural medicine and disease prevention. On top of that, you need to become proficient in firearms — Glock 19 pistol at minimum — as a means of self-defense and survival during times of chaos. Pistol skills are a good place to start, but frankly, if you don’t know how to run a battle rifle, you are not well prepared. I currently recommend the Renegade Plus rifle from Patriot Ordnance Factory. (POF-USA.com) If you’re on a tight budget, get the Renegade without the Plus. Visit the sites that you find the most useful. Many stories will overlap with Natural News, but each site has its own focus that you’ll find extremely valuable. Keep checking back on Natural News each day. Facebook has censored all Natural News posts, Google has penalized all Natural News content, and we have recently been subjected to a five-day, highly sophisticated and well-funded DDoS attack that continues right now. And it’s my job to bring you that truth while helping you survive the chaos that’s coming. Thank you for your ongoing support. Visit this Health Ranger Store nuclear fallout preparedness page to acquire survival items for yourself while supporting our ongoing mission of truth and liberty.